I’m a firm believer in recycling. I’m happy to report that Golf Illustrated columnist Dr. Tom Dorsel agrees with me. Dorsel may not be quite as avid as our family is about putting our newspapers, plastic, and aluminum cans in the bins that help restore these materials to another use. 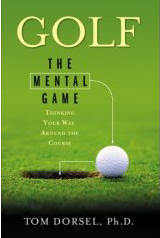 However, he was obviously not averse to reprinting his useful golf psychology tips from the last dozen years or so into a new handy collection, Golf: The Mental Game (Cumberland House; $16.95 SRP). It’s the sort of thing I do on a regular basis for this golf column. These book reviews not only make an appearance in newsprint, they also appear on the web. I applaud Dorsel’s efforts at running his articles again in book form, and not just for the sake of recycling. If a writer truly believes that he’s contributing something useful to the field in which he’s operating, he should do what he can to widen his potential audience. With all due respect to Golf Illustrated and other golf magazines, however, not a lot of golfers will search the library stacks for the back issues. In fact, younger golfers may not fully appreciate it, but there’s a huge amount of good golf stuff that will never be available through Google or some other Internet search engine—because it first appeared in print, and never made it into a digital format. In addition, Dorsel’s potential audience has likely changed significantly since some of these articles first appeared, thanks to the inexorable effects of demographics. Why not give the newcomers a chance to benefit from Dorsel’s wisdom? And there’s a lot here that should help a lot of golfers, not only newcomers, but also those with several years of potentially frustrating experience. Dorsel’s overall focus is to remind golfers of what a difficult, challenging game they’ve decided to play. That being the case, its players should therefore understand the emotional, tactical, and thinking problems that provide so much of the game’s appeal. It sounds a bit contradictory, but his point is that to have the most fun with golf, one needs to be serious about it. In several essays he emphasizes the fact that real improvement comes with presenting the player with frequent opportunities to test their mettle against the course and other players, under tournament or near-tournament conditions. A steady stream of hit-and-giggle options, such as scramble events, won’t be nearly as helpful. Dorsel gives several examples from his own and others’ experience of how to tackle the best that the game can give out. Perhaps his best advice, repeated in many different ways in the course of these fifty essays, is to accept the notion of incremental, gradual progress, all the while focusing on the process of playing and not the particular results of given shot or round. Experienced golfers know, but don’t always remember to appreciate, that it really helps to care a lot about a given shot, until it’s made–and then it’s best to not care at all about what happens after the ball leaves the clubface. Dorsel accepts that this is far easier to accept in theory than in the real world, but he also provides several different strategies to make this primary lesson stick. The book also helps golfers with some of the social aspects of the game, in addition to the highly individual process of playing it. For example, I wish I’d read the segment on playing with partners before I competed in a recent alternate shot format event. I would have been a bit easier on myself, after a few instances of leaving my playing companion with some less-than-perfect situations. This is a well-done compilation, and should be deeply appreciated by the many readers who will benefit from its advice.